It’s fun to toss maple seeds up in the air and watch them spin down to the ground like nature’s own helicopters. This book prompts inquisitive kids to learn about these marvels of aerial engineering, including their real name (no, not whirlybird), the work they do for maple trees, and how to uncover the little trees waiting to sprout from the seeds. 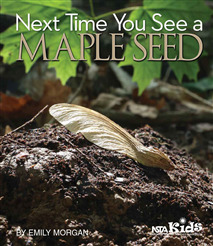 Next Time You See a Maple Seed is a mini class in how tall trees grow from these tiny, twirling winged fruits. Awaken a sense of wonder in a child with the Next Time You See series from NSTA Kids. The books will inspire elementary-age children to experience the enchantment of everyday phenomena, such as maple seeds, Moon phases, pill bugs, fireflies, seashells, and sunsets. Free supplementary activities are available on the NSTA website.